If you find yourself hoisted in a helicopter, strapped to a stretcher or leaning on a ranger in a national park, there’s a good chance you are — or were — a hiker. You’re probably also a man in his 20s. But whatever you are — woman or man, old or young — if you got lost, hurt or otherwise endangered in a national park or recreation area in the Beehive State, you aren’t alone. 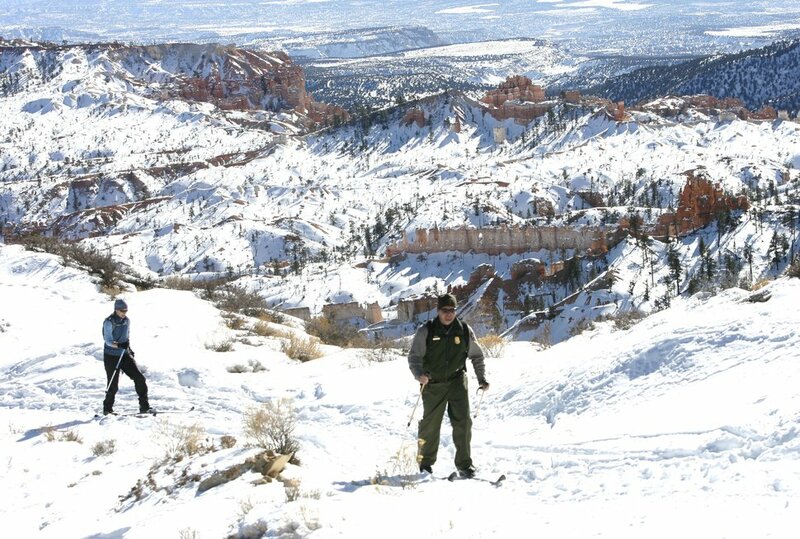 National Park Service staffers at sites in or straddling Utah recorded 324 searches and rescues last year, according to recently released statistics. That’s a 68 percent jump from 2014, the last time the park service released data about its searches and rescues. That year, Utah’s five national parks and its other park service units, including Glen Canyon National Recreation Area, had 193 searches and rescues. Zion and Bryce Canyon — the granddaddies of Utah’s national parks — are where most visitors are getting into trouble. Rangers retrieved 114 people in Zion last year, a 42 percent leap from three years ago. 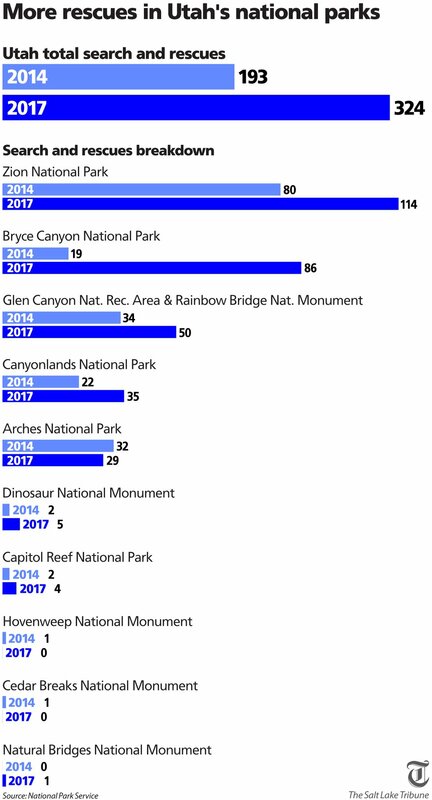 The smaller Bryce Canyon had fewer searches and rescues but experienced an even greater increase — more than tripling, from 19 in 2014 to 86 last year. Swelling visitation is driving the search-and-rescue numbers. Bryce Canyon grew from 1.4 million visitors in 2014 to 2.5 million last year. In that same span, Zion shot up from 3.1 million visitors to 4.5 million. Jeffrey Olson, a spokesman for the National Park Service, said rangers have tried to educate guests on how to stay safe. They also patrol trailheads and trails to ensure visitors have enough water and sun protection, and know the physical challenges they may encounter on any hike. Olson said he was working at Arizona’s Grand Canyon last year. There, rangers or volunteers position themselves 1.5 to 3 miles down the most popular trails to speak with hikers and give water or other aid to anyone in distress. The figures show that in Utah and elsewhere, hikers are the ones most likely to need help. The exception is in places such as Glen Canyon, which encompasses Lake Powell and the rivers that fill it. Of the 50 searches and rescues there, 36 were on the lake; three were on a river. The biggest age segment needing help were men and women in their 20s. People 60 and older were the next largest group requiring aid. Rick Egan | The Salt Lake Tribune | Mark and Shoshanna Hnat cross country ski at Bryce Canyon National Park in 2010. At Bryce Canyon, most trailheads sit on the plateau at 8,000 to 9,000 feet. Similar to what they do in the Grand Canyon, hikers trek down and return by footing it back up. Wesley Baker, the park’s deputy chief ranger, said staffers don’t often go on searches for lost hikers. The more common occurrence is visitors in distress. “We get people who get to a point where they just physically can’t go on,” Baker said. Bryce Canyon has launched preventive strategies like those at the Grand Canyon. On busy days, eight to 10 volunteers in orange shirts staff Bryce’s high-trafficked areas to provide trail information, water or other assistance.